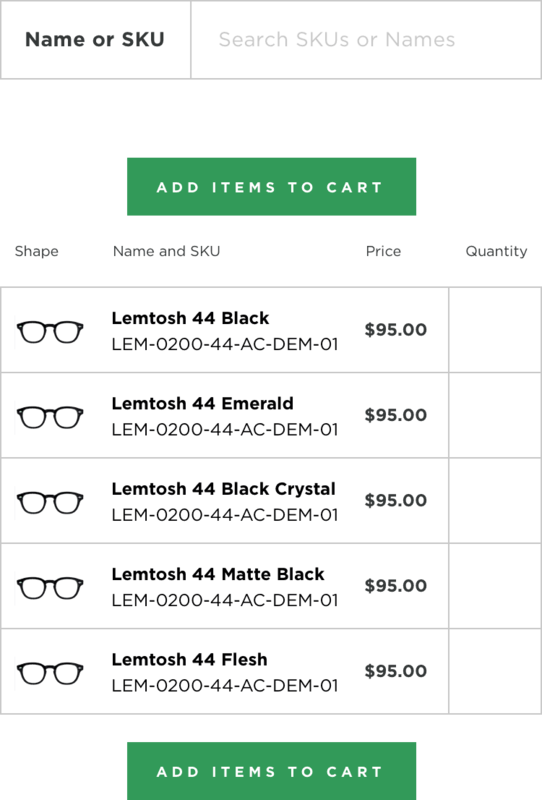 Making it easier for European retailers to get the glasses they want, when they want them. Moscot is an internationally renowned glasses designer and manufacturer. Started in 1915 by Hyman Moscot, the brand is still run by a father and son duo and has been worn by the likes of Johnny Depp, Anderson Cooper, and Tom Hanks. Chris Hemsworth, aka Thor, recently wore Moscot’s most famous glasses in the August edition of GQ. Go check it out! 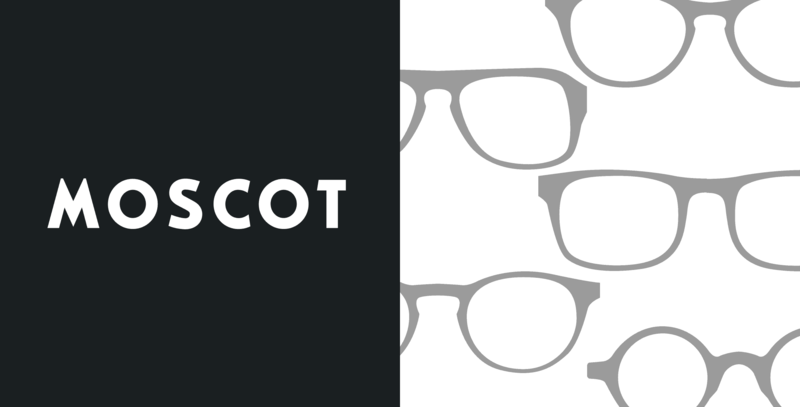 Over the years, Moscot's brand has gained popularity in Europe. In late 2015, they came to our agency to create a more effective, streamlined experience for their European retailers. This Magento based experience was crucial to the growth of their European market. This experience needed to enable buyers to buy bulk orders of frames. The Moscot team also needed to communicate with reatilers about products, promotions, and brand messaging. My role as lead designer was to work with the client team to craft the user and brand experience for the site. I communicated design decisions and incorporated feedback from the client team. I also worked with the client team to consider user needs across many countries and device types. Additionally, I worked with our internal project manager and developers to ensure that the designs were built to spec. While creating the experience, I made sure to maintain Moscot’s brand standards while adding to it where necessary. I expanded their color palette to include necessary warning colors as well as incorporating current imagery, illustration styles, and icons into the experience. Responsive design is always at the core of my design methodology. However, once we heard about retailers ordering on their phones I intensified my focus to make the design responsive. 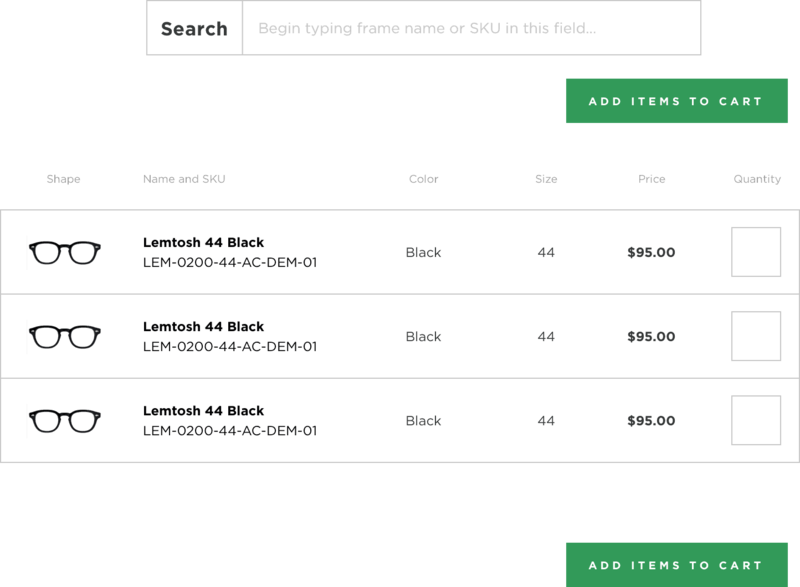 This focus was especially important for elements that help retailers find and filter the products that they are looking for. For many retailers, the only purpose for their visit is to order large quantities of frames. They order a particular style or color for the season and their market. Thus we moved their Quick Order "page" and converted it into a quick access feature from the homepage. This feature incorporated natural language search to ensure ease of use. It also gave them access to order necessary color, size, and finish from the grid. This eliminated several steps from the process and increased conversion. 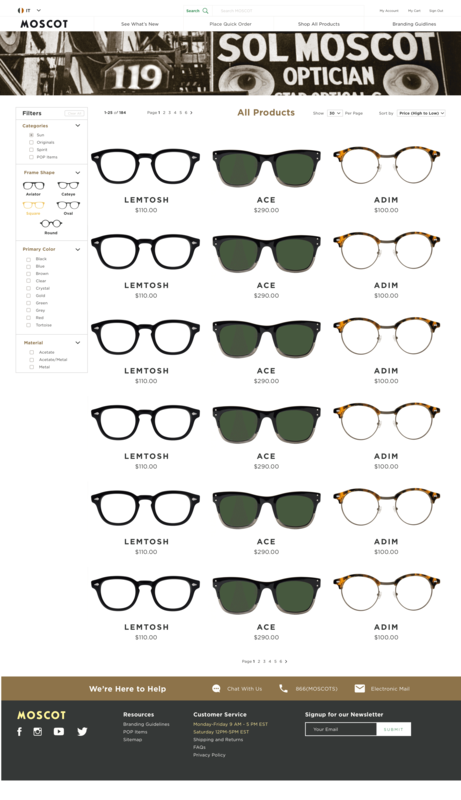 Moscot’s products come in a variety of frame colors, sizes, and styles. I designed a responsive product selector for reatilers to customize their products. This feature was important for newer retailers who may not be as familiar with the product line. And for whom the quick order grid may be confusing or overwhelming at first glance. We found that many retailers often didn't have time or resources to devote to accurate brand management. 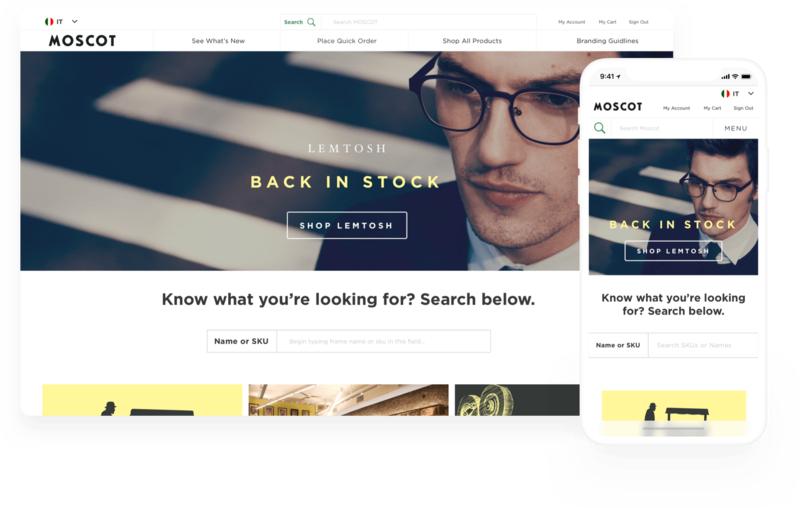 This void had the potential to create a brand to the Moscot team, thus we decided to build out the product pages to include more product details, photos, and illustrations to give retailers as much information when selling Moscot's products as possible. 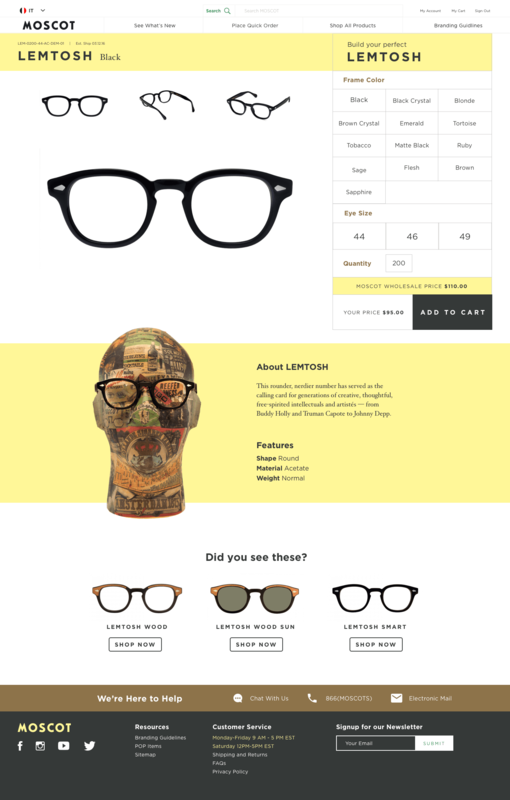 The product page was also designed to mimic the layout and content of Moscot's main retail site. 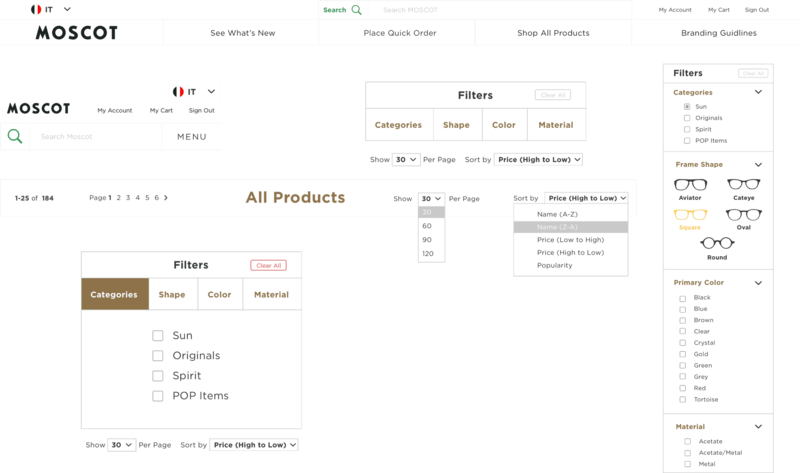 This product page information helps retailers learn more about products and the brand. We focused on designing an eCommerce funnel that would aid retailers in finding the correct product in the right finish, color, and style. I designed the category page to give retailers an overview of products and to let them find the products that they need and want to get to.